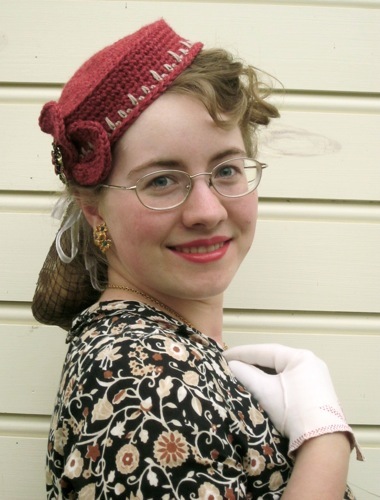 A crochet designer and incurable stitcher for years. Lives with her family in the Cumberland Valley, PA, on an organic 15-acre homestead farm. Lovely! I like the way the handles are made. Inspired by the jewelry worn on Season One of Downton Abbey by Lady Grantham during the Titanic era, these earrings are the perfect way to make your own elegant jewelry for your Victorian, Edwardian, or Titanic costume or just for fun. Crocheted with a few yards of size 10 thread, use the same pattern for the studs and dangles, only for the dangles add a hanging loop. With a few findings and a gorgeous pair of buttons, you can wear either type of earring, and if you make use of the clips on the button cards, interchange the same pair of buttons between them both! Basic stitches, works up quickly. Ideal gift! Buy the pattern PDF in my Etsy shop, JoysinStitches, for $1.50. I don't like to take big projects on an airplane, but in a car if there's plenty of leg room I don't mind big projects. I take whatever I'm working on and usually supplies for the next in line--although often I get in a panic ("What if I use up all this??") and take along lots more than I'll ever get done because I end up looking out the window most of the time! :-) For some reason it's hard for me to get started crocheting while traveling, but once started, I can get a lot done unless we're going through scenic country. It depends on how tired I am, too, and how eager I am to get done with whatever I'm working on. What lovely yarn! Your lovely shawl is a perfect way to use yarn like this! What lovely texture in a doily! Your colors are beautiful too and the doily looks perfect. Gorgeous! I love tapestry in thread. It makes a stunning center for your doily! I used to have a terrible habit of starting projects and not finishing them, so I made myself finish all the loose ends and then pace myself to do just one thing at a time - until I started designing! Now I often have 3 or 4 projects going at once, and I get them finished, too! Maybe 2 different designs for different deadlines, one separate idea I want to make into a model, and one for a gift. And always more lined up like dominos to take the place of one I've finished! Usually vintage acrylic yarn is the worst for roughness on fingers. Novelty yarns can be difficult, especially to unravel. But I had a terrible time once with an expensive handspun hank of laceweight wool. Beautifully dyed, but it was rough even with how thin it was, and I could not unravel it! I ended up breaking it off while trying to unravel it and never finished the broomstick lace shawl I was making. The dye smell was unpleasant and strong, too. If you're interested in reenacting or wearing costumes, doilies make great jabots! Just pinch it in the middle and pin it under a collar with a brooch. Finer thread doilies work really well for this. Aw, that's too bad. I'm in PA too. Allentown is about 2 hours from us, though! These designs of mine are coming soon in Crochet World's December 2013 issue! E-magazine on sale 10/11, print copy available 11/5 on their website, www.crochet-world.com.